Italics (Tally) - Rocky Mountain Great Dane Rescue, Inc. This sweet girl has been in rescue a while and finally her forever home found her. 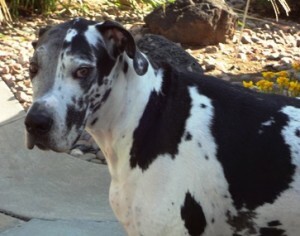 Brad has always wanted a great dane and is extremely happy that Tally will be that Dane, she has a place waiting on Brads bed to sleep and days of going on Hikes on the Caldwell trails. Way to go girl!